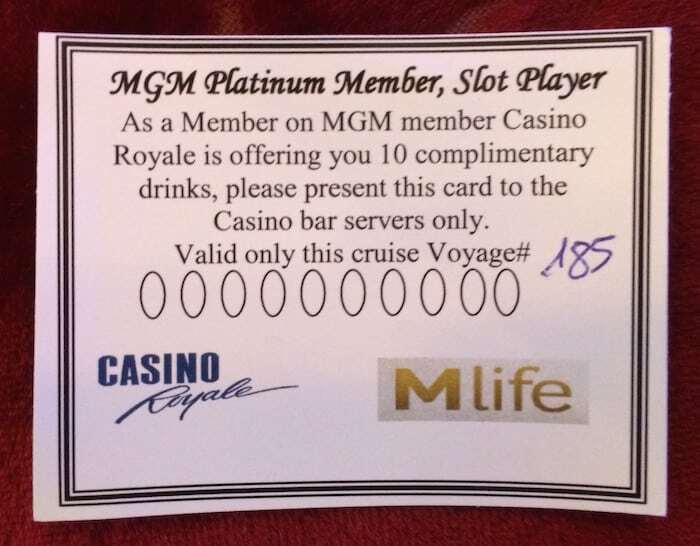 One of the perks of earning Mlife Platinum status is a free Royal Caribbean cruise through Mlife Vegas annually. This benefit has been around since 2013. In speaking with the folks at Royal Caribbean, it seems like the partnership is renegotiated each fall so no guarantee how long this partnership will last. This only works if you have earned your Mlife Platinum (or Noir) status. If you status matched through Hyatt you are not eligible for this promotion. It isn’t actually free. You are on the hook for taxes and gratuity. My three night cruise cost $233 for me and my travel companion. It might be less if you cruise alone; but I honestly am not sure how a cruise would be as a single person. The length of cruise you are eligible for depends on your recent play. Every Platinum member is eligible for a minimum 3 nights. This is what I was eligible for or I could have received $300 towards a longer cruise. 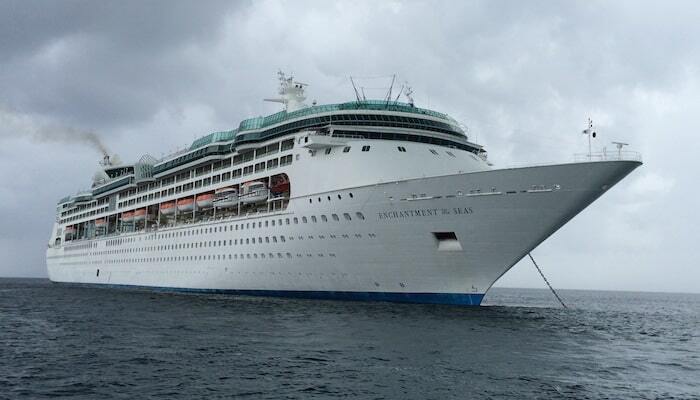 There are only two 3-night cruises on Royal Caribbean. One out of Port Canaveral, Florida and the other out of Miami. You must call Royal Caribbean’s casino line to book. You cannot do it online. The number is 1-800-762-0702 (Monday – Friday 9:00am – 9:00pm ET). While there are the above limitations, it is still a good deal if you are looking for a quick cruise. Had I not had the free cruise it would have been about $1200 for the two of us. The cruise does tend to get expensive quickly unless you live in Florida and don’t drink. Flying from Seattle across the country for a three night cruise may not make sense financially. I was able to add on a few days at Disney World to make it worth my time and justify the cost of the flight. I also rented a car and had to pay $60 to park at the cruise terminal. Alcohol is not included (with a few exceptions below) and can run up to $200 for a beverage package per person. There are some perks that Mlife Platinum members also get that the average cruise passenger wouldn’t receive (Noir receives additional benefits, but not substantially more besides the longer cruise). 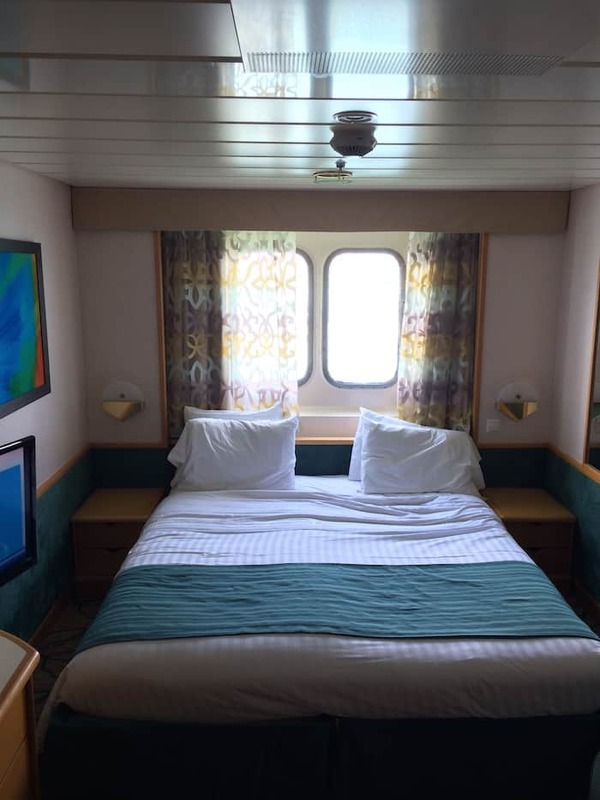 A stateroom for two people with a window on the bottom floor. If you want a balcony or higher floor you can pay to upgrade if space is available (it wasn’t on my cruise). 10 free drinks at the Casino bar. This includes premium beverages (I had a number of Grey Goose and sodas). I decided not to purchase a beverage package so went through the 10 drinks easily. Specialty dining at Chops Steakhouse (only available on the Enchantment of the Seas out of Port Canaveral or 4+ day cruises). This is the nicer restaurant on the boat where you actually order off a menu and your food is prepared for you. Other dining options are the buffet or main dining room (included for everyone). 30 minutes of internet. I was given 60 minutes of internet (by accident?) but it didn’t work when I used it so this benefit was worthless for me. The website lists that you get a welcome amenity. We had a plate of fruit (banana, apples, grapes) waiting in our stateroom. Priority check in/departure. We got to the terminal early and there was no line. At the end we decided to carry our bags off so we didn’t have to wait at all. So this benefit was also worthless for us. No fee for cash advance in the casino. Normally Royal Caribbean charges a 5% fee for any money you take out at the casino and charge to your account (known as a SeaPass). I took out $300 and its as nice to not have to pay $15 on this. This is also an opportunity for manufactured spending as it is simply charged to your credit card as Royal Caribbean (not a cash advance). One thing that wasn’t advertised that we received was an invitation to an elite breakfast one day at the nicer restaurant. I will write a review of the cruise later (spoiler alert, I don’t think I would cruise again with Royal Caribbean even if I only had to pay tax and gratuity). However, I had not taken a cruise in 15 years and was interested in trying it out. This was a good and relatively cheap way to try it out. I discovered I am not a cruise person, but if you are, and you live close to Florida, and don’t have crazy expectations, maybe the free Royal Caribbean cruise through Mlife Vegas will be worth your time. Read the (outdated) info page about the free cruise (and benefits for all Mlife members) here. Sidenote: It was just announced that Celebrity will also be offering the same benefits (they are a sister property of Royal Caribbean). Thanks for the details of booking through the MLife. 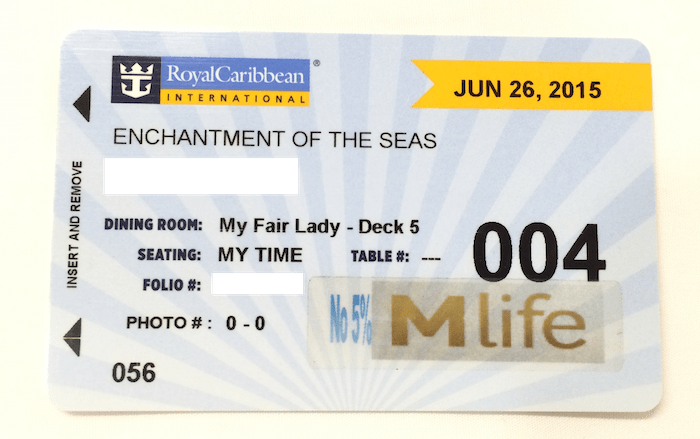 Just out of curiousity, did you ever receive MLife tier credits for your play on the cruise? Great question! I wasn’t paying close enough to my before/after Tier Credits, and I don’t think it is possible to see a breakdown of where you earned the credits online at least. I’ll be in Vegas in a week; I’ll see if I can find out from Mlife if I have points from the cruise. 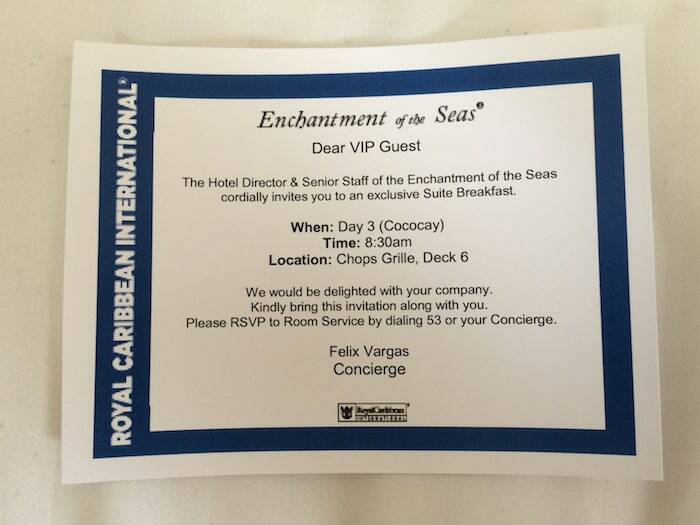 I wouldn’t judge Royal Caribbean on the Enchantment of the Seas. That is definitely not the standard I am used to with Royal. That is the only ship that I’ve had a bad experience on. I don’t know if the ship’s management is the reason, but it is not a reflection of their fleet (and I’ve been on many of them, in all classes of ship). I am not a fan of Enchantment at all. Next year they will have the Majesty (renovated with nice upgrades) and if they are anything like the Monarch, it will be a great experience with the 3 and 4 night cruises again. Thanks for this feedback. I am not sure I would do a Royal Caribbean cruise after my experience; but it is good to hear that other ships provide a much better experience. Hi. 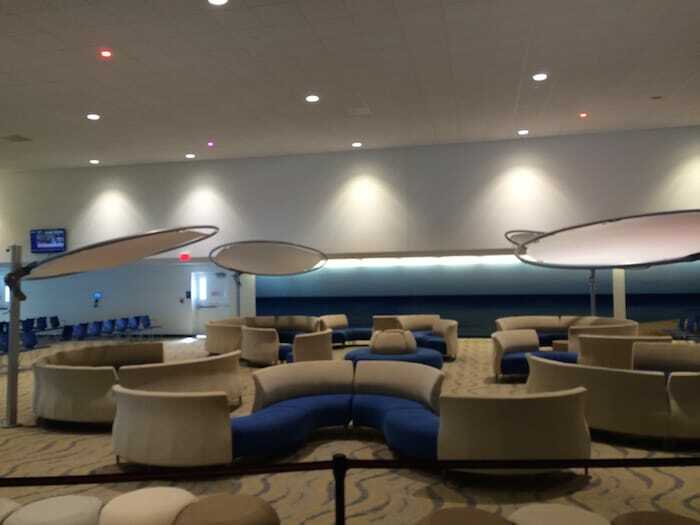 Thank you for sharing – there is not a lot of info out there about the Mlife / RC cruise. Would you please tell me – were all the perks already “loaded on your card” like the restaurant or did you have to go get them applied? So when you checked in for the cruise, did they hand you the drink coupon, internet coupon etc? How did they verify that you had access to the departure lounge and priority boarding? Thanks so much. I am using this perk in March. I did have to check in with the casino host/manager upon check in. There was a letter in my room explaining this as well as letting me know a reservation had already been made for the Chops restaurant (which was able to be changed if I wanted). 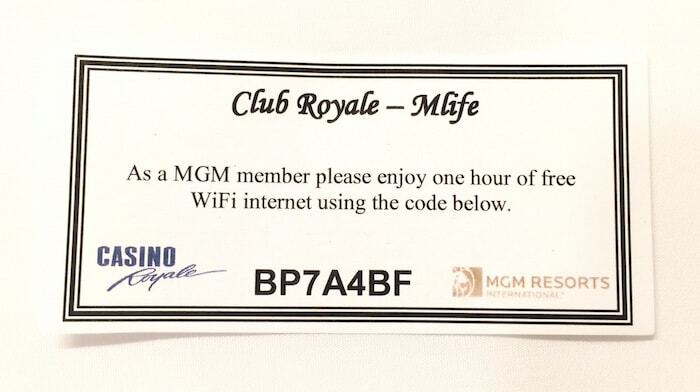 The casino host then gave the free drink coupon and wifi info. He also put an “Mlife” sticker on my cruise card indicating that I could get cash advances without a fee. As for the priority boarding and departure lounge: I cannot say for sure as when I arrived there were no lines at all so I did not inquire. I think you would just go to the priority line and see what they say. Worst that would happen is they would send you to the standard line. Hope that helps. Let me know if you have any additional questions!